"This is a delicious light summer salad that is a little on the sweet side rather than than the tangy-vinegary side." Peel the cucumber in stripes lengthwise with a vegetable peeler, alternating skinned stripes with peel for a decorative effect. Slice the cucumber in half lengthwise, and then thinly slice. Place the cucumber in a salad bowl with the tomato and red onion, and mix together. Pour the rice vinegar and lime juice into a separate bowl, and stir in the sugar until dissolved. Pour the dressing over the salad;mix, cover, and refrigerate until chilled, at least 30 minutes. Just before serving, stir in the cilantro and sprinkle with chopped peanuts. 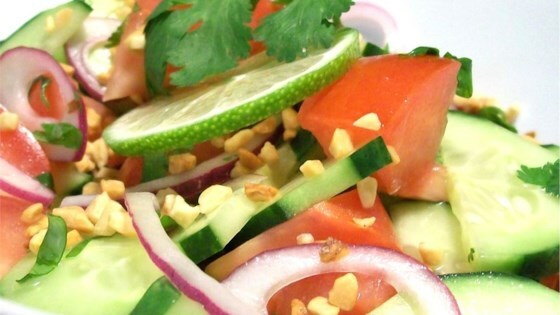 Learn how to make this delicate cucumber salad, full of Thai flavors. You can substitute 1 packet of Splenda for the white sugar. Something's missing, but I don't know what. I made this to accompany a Thai meal. I may make it again to figure out what's missing. This is a really nice cucumber salad variation. I don't care for cilantro, so I substituted parsley. I also used yellow tomatoes and red tomatoes to give it even more color. It was a big hit. So simple and yummy! Even better the next day. I plan to keep a bowl of this in the fridge all summer! A nice cucumber salad that is not overly sweet. The peanuts are a nice addition.